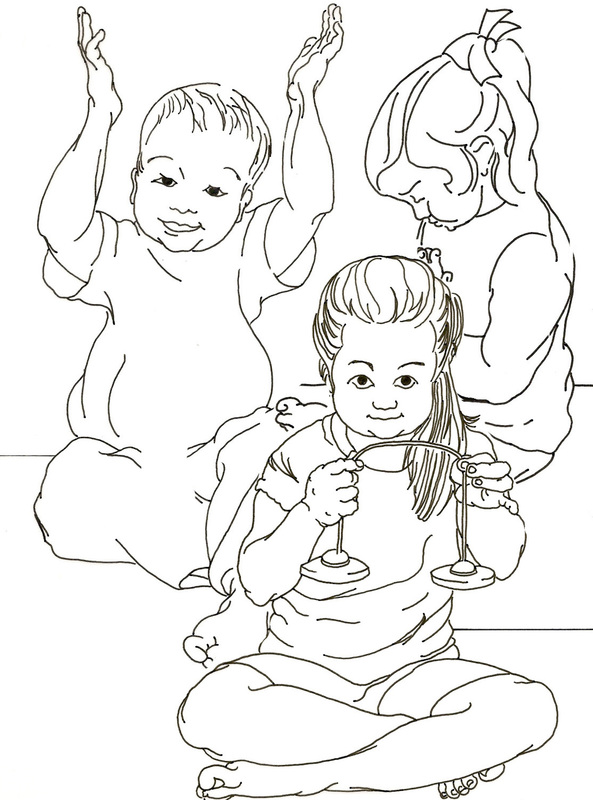 My sister’s (Nancy Williams) book, Yoga Therapy for Every Special Child, is about to be released! Congratulations Nancy! I hope you reach out to many by sharing your program this year and in the years to come. When Nancy began writing her book, she asked me to illustrate it. I drew and redrew to attempt to tailor my drawing skills to what she needed to best illustrate her text. This consisted of creating simple line drawings of yoga poses to go along with her approach to yoga therapy for special children. I learned that I needed to push back self-expression and “draw out” the excess lines so the poses would be revealed in an easy illustration for the reader to assimilate. For more on illustration check out Curious Crow’s new post on the subject. June Malone has also talked about illustration. Thank-you to Jay Bastian for his careful tutelage in Photoshop. Without these skills, I would not have known how to submit my drawings digitally. 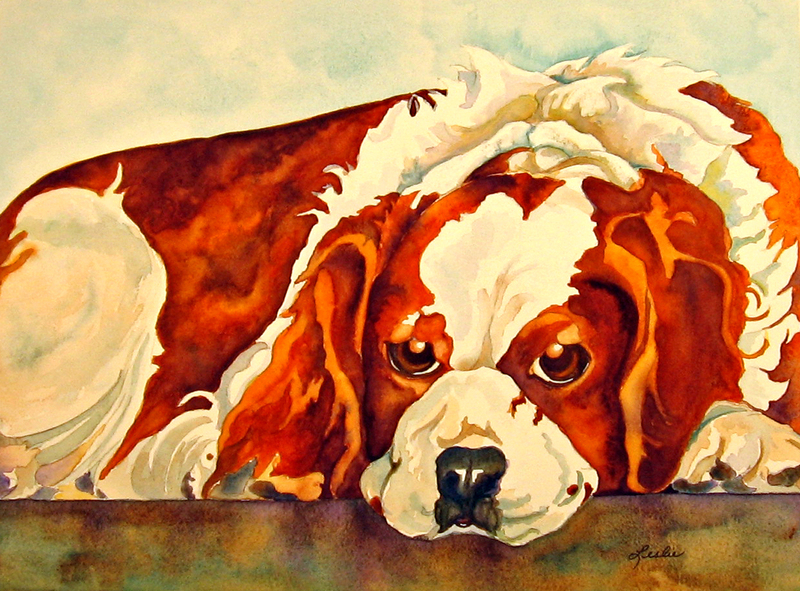 This is another pose of the Cavalier King Charles spaniel, Danny. The other can be found here. I rested heavily on my drawing as I painted this because I liked the line of it. Just as a side note: See that patch of blue sky that looks like it has whispy white clouds in it? I try to do that with skies in my landscape paintings and haven’t been able to get that look since. I think that’s why I love this medium so much. I get this feeling I can never know it all and I like that. This is a tree in my backyard that I call my “Charlie Brown” tree. When I moved in 8 years ago, I had to remove a wire that the previous owners had placed to support it. They must have been concentrating on other things and the wire became imbedded in its trunk. With the aid of a local tree service and some extra vigilance, we have been able to help it keep growing. I thought a portrait of her might be a good way to wish all of you a very Merry Christmas! Plainview has just written about being a tree hugger here. I think that is a great thing to be! 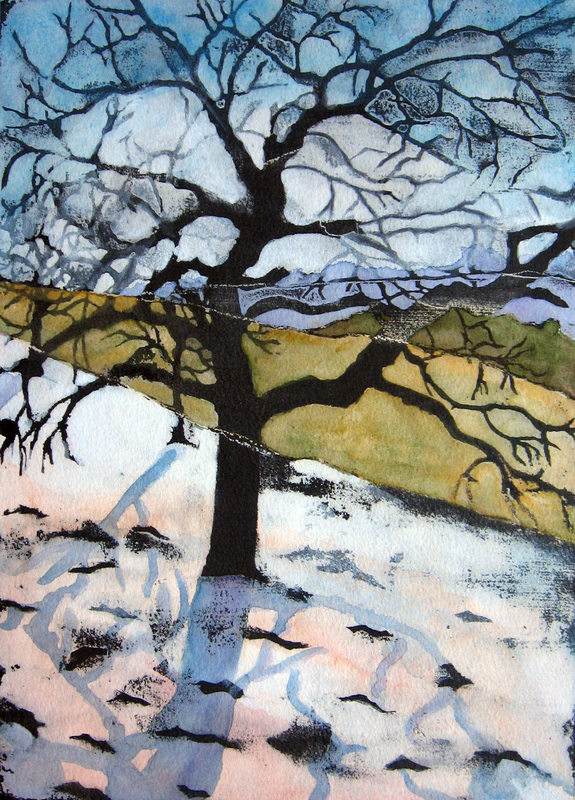 Al at Artist Exit O Riverblog has written a wonderful post about an old Cottonwood tree here. 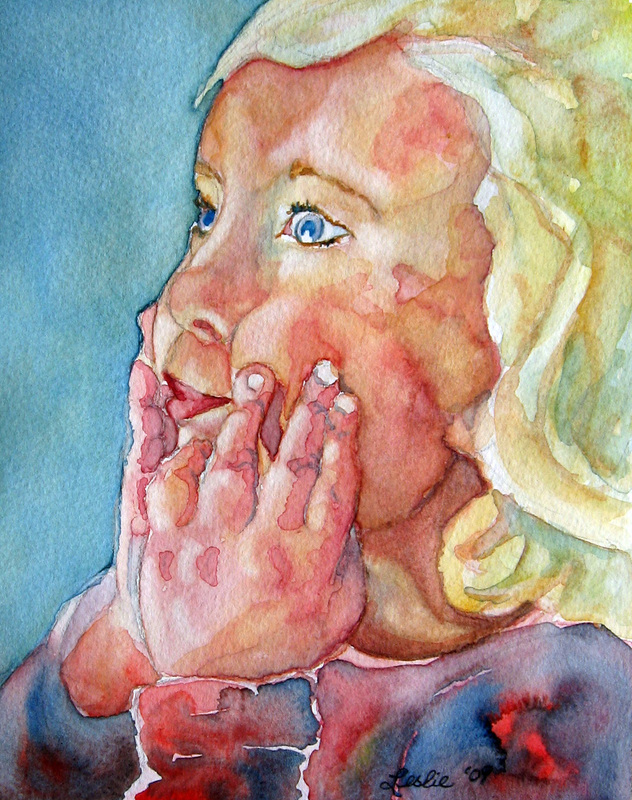 The above portrait was done in an evening working primarily wet-on-wet on inexpensive 90 lb cold press paper. This paper does not take readily to layers of glazes but is fun to work on because it enhances that wet look no matter how you choose to apply the pigment. I like it for short sketches of this nature. There are times when your friends have more faith in your skills than you do. Always try the challenges they offer you. This is a challenge Tracey offered me. Sammy is her sister’s little dog. I painted her about three years ago and posted her here. Her nick name is “Left Turn” because of the ear she carries out to the side. What better time to post her with her favorite toy, “Hippo”, than at Christmas. From what I hear, she carries it with her everywhere. 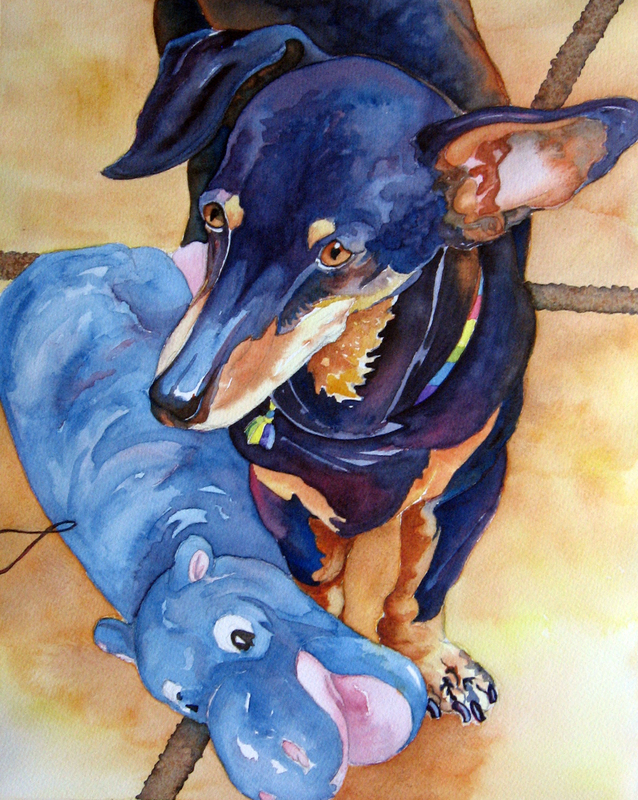 Thank-you for the comments on the blue dachshund pup I painted recently. I really worked on the black for this so she didn’t turn out too blue. I used mixtures of red, yellow and blue to create the grays and blacks I used here. In some areas, I dropped neutral tint (a black) to darken it a little more. Be careful when you do this. I’ve found that black looks very chalky and flat without the use of other colors. All in all, this was a significant challenge for me as I have never searched for black in my colors. This is a painting I did a couple of years ago when I began to paint with watercolor on gessoed paper. I use Aquarius 2 watercolor paper because it doesn’t ripple as much when I apply gesso to the surface. I use white acrylic gesso and a 2 inch bristle brush (the stiffer the bristles the better). I buy the “cheapies in a paint store to use for this and wash the gesso out immediately under warm water after covering the paper. I squirt a fairly large dollop of gesso onto the paper in the center and work it outward with my brush creating swirls and swishes in the surface of the gesso. I always pick the paper up and hold it to a light source. By doing this you can see areas that may not have been covered by the gesso. I patch those areas and lay the paper on newspaper to dry overnight. The next day, I paint with watercolor on this surface I’ve created. This takes some practice as you paint with much less water and a more creamy mixture of your pigment. It is very easy to lift out the pigment if you make a mistake on this surface. It is similar to working on Yupo, but not as difficult. Generally I end up with a more abstract version of the subject than had I used watercolor paper with no gesso. 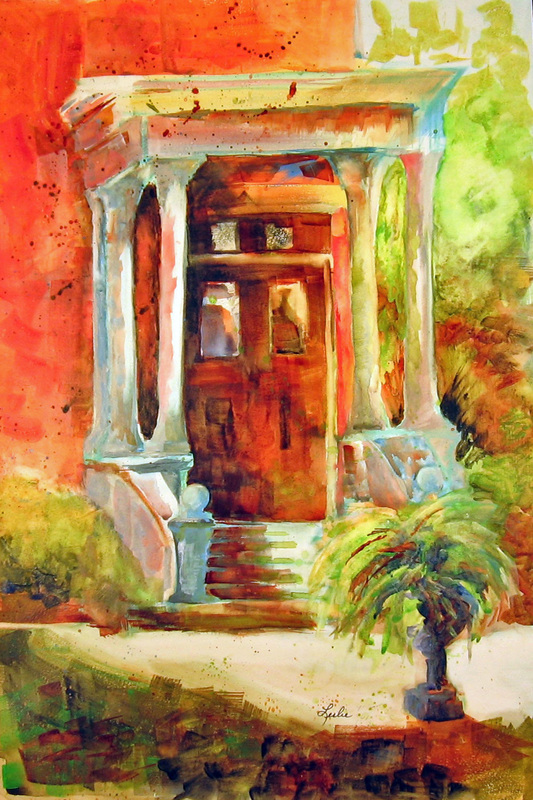 Other examples of watercolor on gesso can be found here and here. 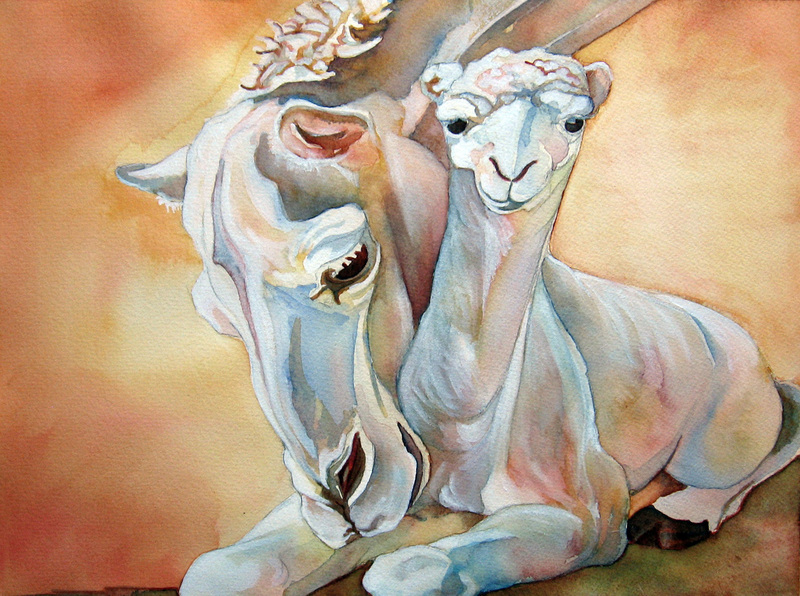 I couldn’t resist painting this picture of a mother camel and baby posted in the camels section of wet canvas. Most of the time, I refrain from using white in my watercolors. I don’t know why; something about saving the white of the paper? I say ” do what you have to do! 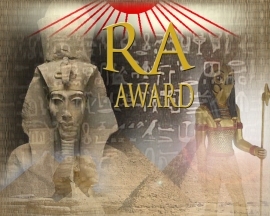 ” for the outcome you wish to receive.Too many rules really stunt growth. I have left the white of the paper. I have used yellows in place of white areas…….and I have painted with white. When using white, I wait until I have all my other colors down. I sometimes feed other colors into the white. Remember that white lightens that particular color and, if you don’t want that effect, make sure you have your value pattern down on your painting , first. 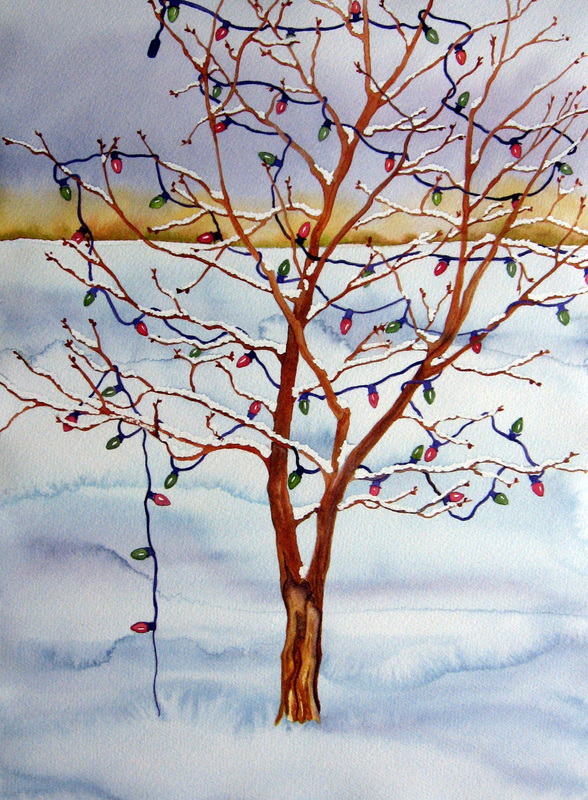 I have used Winsor Newton whites and white gouache but usually prefer American Journey titanium white watercolor. It is opaque enough to appear white and does not dry shiny. Another example of a painting where I added white at the end is found here. My Grand daughter came running in the front door this morning saying, “Grandma! It’s SNOWING! It’s SNOWING!” No matter how tired I am of snow by the end of winter I always love the first day of snow. The quiet, like the snow is insulating the sounds of the earth, is the first thing that I notice. I guess that is why I don’t mind living in a part of the world that the seasons change with such magnitude. This painting is another gouache resist and my favorite so far. The subject material lent itself to the technique better than the ones I’d chosen previously. It also took me the longest to fill in all the spaces between the branches with the qouache. Directions for this technique may be found here. This technique can be found on YUPO paper on Sandrine’s Blog here. Painting this cow was fun. At first I looked at it as a daunting challenge, but it wasn’t. I used round brushes throughout and worked light to dark. I waited for the figure of the cow to dry and wet the background being careful to carve around the hair and shape of the cow. 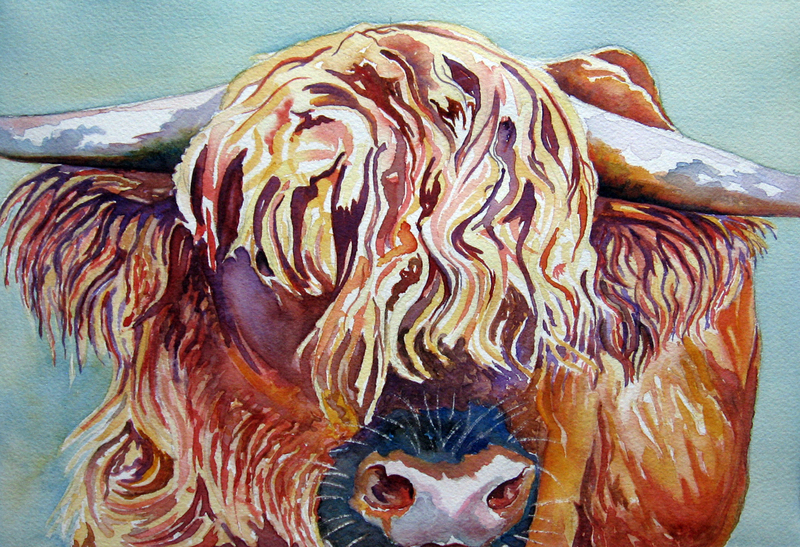 I then dropped in light washes of the blue and yellows I’d used on the cow. 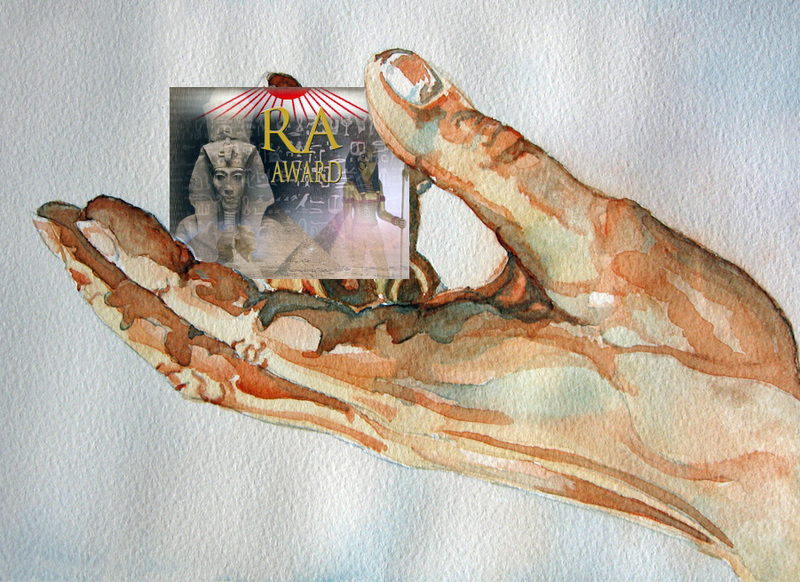 The recipient passes this award on to another blogger in seven days and pledges to follow the new recipient’s blog. for her wit, wisdom and continued journey in art.